On an otherwise glossy day, a blast goes off and a body thuds to the ground at Nora’s feet. There are terrorist attacks in the city all the time, but Nora can’t forget. So Nora goes with her mother to TFC—a Therapeutic Forgetting Clinic. There, she can describe her horrible memory and take the pill that will erase it. 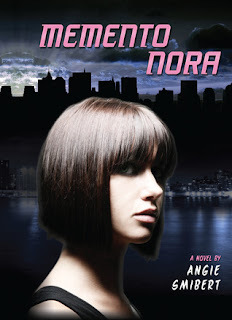 But at TFC, a chance encounter with a mysterious guy changes Nora’s life. She doesn’t take the pill. And when Nora learns the memory that her mother has chosen to forget, she realizes that someone needs to remember. With newfound friends Micah and Winter, Nora makes a comic book of their memories called Memento. Memento is an instant hit, but it sets off a dangerous chain of events. Will Nora, Mica, and Winter be forced to take the Big Pill that will erase their memories forever? Memento Nora is a surprisingly small book, scarcely bigger than my hand and not even 200 pages long. It’s written in an interesting narrative style, where our three main protagonists, Nora, Micah, and Winter all tell us their perspectives of the story on a tape recording. The thing about Memento Nora is that, plot-wise, I didn’t feel much fluctuation. There wasn’t too much action going on, and by the end of the novel, I felt like the story hadn’t gone very far. But I don’t think this was the fault of the story itself (which was a really great premise) but rather that the novel was way too short. I think another 100 pages could have been added, and the novel would have been much more fleshed out. Another consequence of the story being so short was that I never got a good chance to get into the characters. Angie Smibert created an interesting and quirky cast of people here, and I regret that I couldn’t spend more time reading about all of them. I can’t wait for the sequel to see what happens! The concept was a good one, and is actually very frighteningly real. The society isn’t very different from our at all, and someday soon there may be a little white pill that will make us forget things we shouldn’t be forgetting. Overall, I liked Memento Nora very much. I’m definitely looking forward to the rest of the series. I five this novel 3.5 stars out of 5.